6th century Madaba Map found during construction in 1898 of St George’s church, originally uploaded by anilegna. Madaba, مادبا, is a capital city of Madaba Governorate of Jordan, which has a population of about 60.000. Madaba is the fifth most populous town in Jordan. It is best known for its Byzantine and Umayyad mosaics, especially a large Byzantine-era mosaic map of Palestine and the Nile delta. Madaba is located 30 miles south-west of the capital Amman. map portrays the physical charteristics of the Eastern Byzantine World… on Flickr – Photo Sharing! including rivers, valleys, the dead sea & its neighbouring hills & towns… on Flickr – Photo Sharing! the center piece is Jerusaleum, including the Church of the Holy Sepulchre on Flickr – Photo Sharing! What is the Mosaic Map? 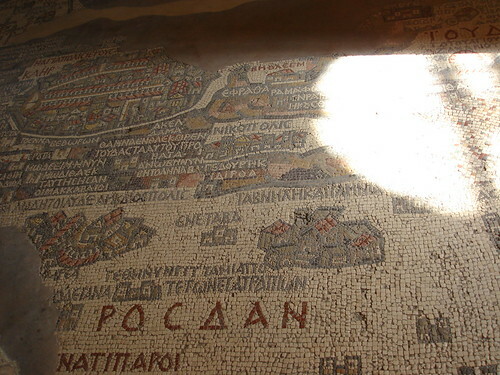 The Madaba Map is the oldest extant map of the Holy Land and is dated to the middle of the 6th century AD. It was discovered late in the 19th century, during an excavation and reconstruction of a mosaic floor in St George’s Church in Madaba, Jordan. 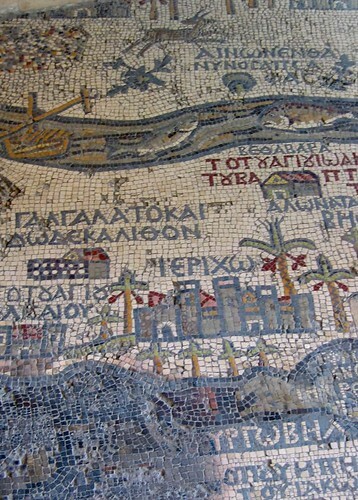 The mosaic is a detailed map of Jerusalem as it appeared at the height of the Byzantine period. The map depicts some famous Old City structures such as the Damascus Gate, St. Steven’s Gate, the Golden Gate, the gate leading to Mount Zion, the Citadel (Tower of David), the Church of the Holy Sepulchre, and the Cardo Maximus. 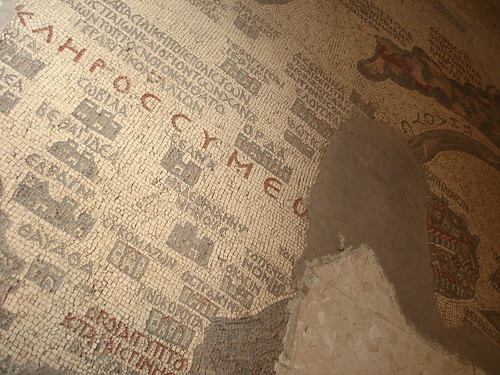 Madaba’s Jerusalem Mosaic Map on Flickr – Photo Sharing! 1029 on Flickr – Photo Sharing! the area depicted stretches from Tyre & Sidon to the Egyptian Delta & from the Mediterranean to the Eastern Desert on Flickr – Photo Sharing! 6th century Madaba Map – dead sea on Flickr – Photo Sharing! Mosaic, originally uploaded by Brent73. 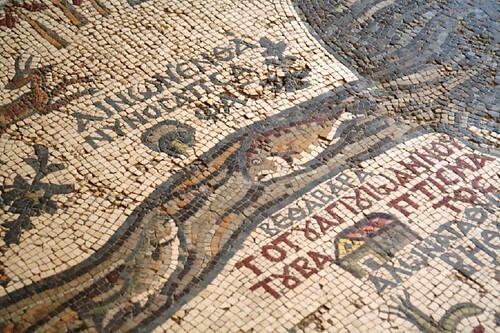 How were the mosaics found in Madaba? The first mosaics were discovered, purely by chance, during the building of the new permanent dwellings using squared-up stones from the old monuments. 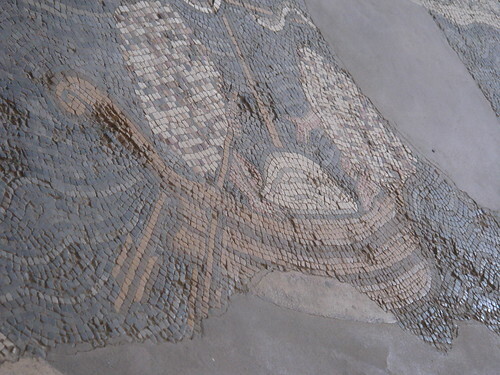 The new inhabitants of Madaba, made conscious of the importance of the mosaics by their priests, made sure that they took care of and preserved all the mosaics that came to light. 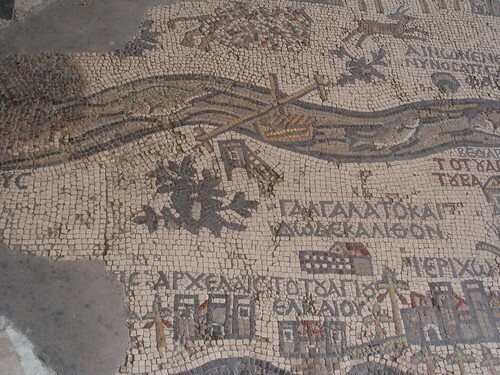 The mosaic Map of Madaba was discovered in 1896; the findings were published a year later. This discovery drew the city to the attention of scholars worldwide. It also positively influenced the inhabitants who shared the contagious passion of F. Giuseppe Manfredi to whose efforts we owe the discovery of most of the mosaics in the city. 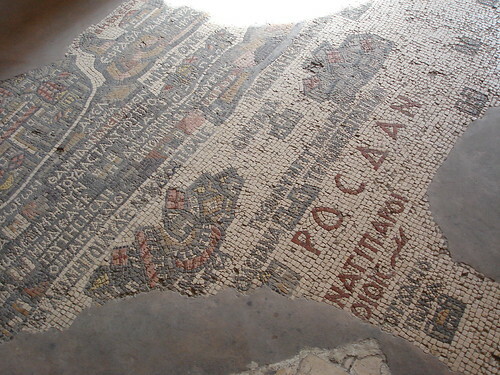 Madaba became the “City of Mosaics” in Jordan. The northern part of the city turned out to be the area containing the greatest concentration of mosaic monuments. During the Byzantine-Umayyad period, this northern area, crossed by a colonnaded Roman road, saw the building of the Church of the Map, the Hippolytus Mansion, the Church of the Virgin Mary, the Church of Prophet Elijah with its crypt, the Church of the Holy Martyrs (Al-Khadir), the Burnt Palace and the Church of the Sunna’ family. 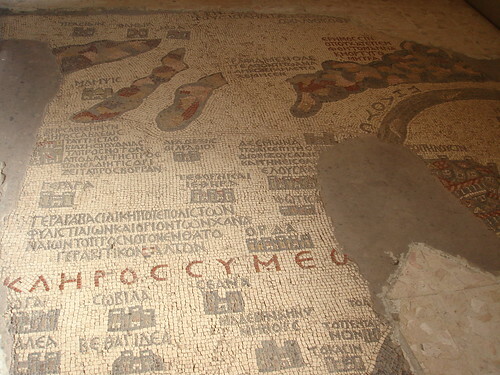 The Madaba Mosaic Map is an index map of the region, dating from the sixth century CE, preserved in the floor of the Greek Orthodox Basilica of Saint George. With two million pieces of colored stone, the map depicts hills and valleys, villages and towns in Palestine and the Nile Delta. 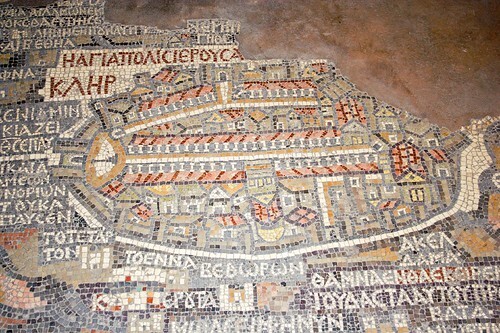 The mosaic contains the earliest extant representation of Byzantine Jerusalem, labeled the “Holy City.” The map provides important details as to its 6th century landmarks, with the cardo, or central colonnaded street and the Holy Sepulchre clear visible. This map is one key in developing scholarly knowledge about the physical layout of Jerusalem after its destruction and rebuilding in AD 70.